One of the Couchbase data platform’s key features is the ability to replicate bucket data in another geographically remote location to provide resilience in the event of a network or power fault. This section outlines a few scenarios and how to configure your Couchbase clusters accordingly. This is by far the simplest deployment. Since both Couchbase Server clusters are in the same pod network, and both have access to DNS, XDCR will just work out of the box. TLS can also be used to secure communications with a wildcard certificate. If the pod networks are able to communicate with each other, and you are using a service mesh which is able to replicate the cluster DNS records, then XDCR will work once the service that is automatically created for the cluster has been manually replicated in the remote cluster. As DNS is available, TLS can also be used to secure communications with a wildcard certificate. For all other situations, you will need to enable the XDCR exposed feature in the cluster specification. TLS is currently not supported, since addressing is via IP address. You will need to enable XDCR under exposedFeatures in the cluster specification. TLS is currently not supported since addressing is via IP address. The XDCR exposed feature exposes pod ports as node ports. Clients that are aware of this extension are able to access the cluster services via node IP address and node port. As a result, the client must be able to route to the destination node network. As the pods from one network are routable from the other and you have dynamic DNS, establishing an XDCR connection with the target is as easy as specifying something similar to cb-example-0000.cb-example.default.svc:8091 as per usual. The diagram below depicts the network flow when establishing an XDCR connection via IP and the exposedFeatures property. 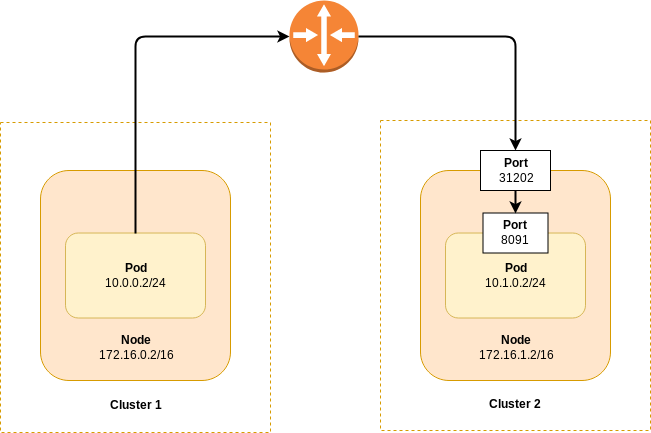 This assumes two nodes in sepparate Kubernetes clusters can communicate with each other. The router depicted could be a switch, router, VPN connection or any other infrastructure which allows layer 3 communication. The server ports used for communication between clusters for XDCR may need explicitly allowing depending on your environment. By default these ports will be in the range 30000-32767 but it may differ between cloud providers or depending on your cluster configuration. If a connection fails to establish please ensure this port range is allowed by firewall and security group rules. This applies to all Kubernetes nodes that can host Couchbase server pods. When establishing the XDCR connection from the Couchbase UI console in cluster 1 to cluster 2 we’d use the connection string 172.16.1.2:31202.